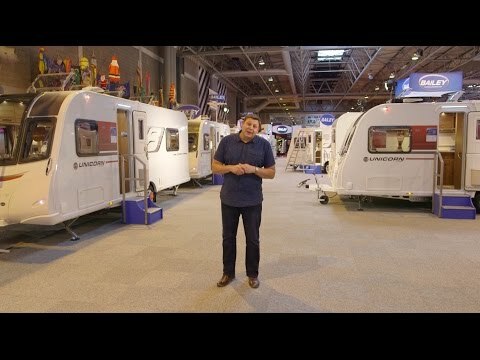 Get inside the twin-axle Bailey Unicorn Pamplona with Practical Caravan's Group Editor Alastair Clements! All four-berth Bailey caravans in the Unicorn range come in both single- and twin-axle forms, and the new centre-washroom model is no exception. For a floorplan in which space is at a premium, the extra length afforded by a twin-axle chassis should make a world of difference, addressing the compromises in particular in the lounge and master bedroom. One thing is for sure – it’s a better-looking van than its single-axle sibling, the Bailey Unicorn Cabrera. The windows are well spaced on the Pamplona to make the most of the distinctive graphics of this Bailey caravan. It rides on a quartet of alloy wheels, too (with two Secure wheel locks and receivers part of the standard kit). The Pamplona's spec will look familiar to anyone who is au fait with the rest of the Bailey Unicorn range. But that’s no criticism because it’s packed with toys. Among the headlines are Alde wet central heating, a Truma solar panel, a Tracker, plus Al-Ko AKS, ATC and shock absorbers to smooth the ride on tow. There’s also a 40-litre on-board water tank, a feature only fitted to twin-axle Unicorns. It weighs in at 164kg more than the single-axle, yet the 1714kg MTPLM is significantly lighter than most of its twin-axle rivals, which tip the scales at 1800kg or more. This is particularly useful if you don’t have a huge tow car, or if you plan on doing plenty of touring rather than leaving your Unicorn Pamplona on a seasonal pitch. There are standard steadies up front and heavy-duty items to the rear. Most of the services are on the offside of the van – apart from the hook-up, so you’ll need to take care to avoid a trip hazard. It’s in the main living area where the additional length of the twin-axle chassis really starts to show in the Bailey Unicorn Pamplona. Six can sit around the freestanding table in comfort, particularly if you remove a couple of the end bolsters, and there’s masses of room for a couple to lounge – though, the only TV point in here is on the front shelf. This area feels as though it would suit those who enjoy socialising or spending a lot of time in their caravan. And we're pleased to note that the table is conveniently stored in a narrow slot cupboard alongside the fridge, rather than in the rear bedroom as is often the case with this layout. Our test van was fitted with the optional Trafalgar soft furnishings, with their leatherette facings. It is a matter of taste, of course, but we’d be tempted to save the extra £199 and pick the more modern-looking standard Kensington scheme. Day or night this is a superbly lit space, with masses of glazing plus a large Heki bringing in lots of daylight, and attractive spotlights around the perimeter making for a pleasant feel at night. The main kitchen area matches that of the Cabrera, and that’s no bad thing. After all it’s well-equipped, with a Thetford oven, grill and dual-fuel hob – sensibly set back to avoid cooks getting tangled up in the washroom door. There's also plenty of storage and a microwave, although unfortunately it is sited directly over the hob. Some might prefer an Omnivent to a rooflight to evacuate cooking smells, but it’s otherwise hard to quibble. The Pamplona really scores on the nearside, where you’ll find a huge, 190-litre Dometic fridge and a separate freezer – just the thing for seasonal-pitch users. There’s no sideboard, but alongside there’s a slot cupboard for the table and some useful shelves, plus there’s plenty of storage in the galley opposite. There’s no complaint about space in the washroom of this Bailey caravan. It is simply vast. It is even deeper than that of its single-axle Cabrera sibling, offering masses of space for dressing. With a door into the main living area, and a pair of sliding doors into the bedroom, this space doubles up as family bathroom and en suite, depending on which door you enter through. The circular shower feels more part of the room than it does in the single-axle version. It features the same shelves and EcoCamel Orbit showerhead – as well as the same wheelarch intrusion. The extra depth has allowed Bailey to add a useful cabinet on the offside wall beside the laundry basket – ideal for storing loo rolls for the nearby toilet. The washroom is bright thanks to a clear window and rooflight. Longer sofas, of course, mean larger beds in the lounge. In fact, in the Bailey Unicorn Pamplona they are long enough (at 5ft 7in on the nearside, 5ft 10in on the offside) to be used as single berths by teens. Pull out the slats, rearrange the cushions and the settees make up into a large, albeit slightly misshapen, double bed, with reading lights in all four corners, to suit whichever set-up you choose. The rear master bedroom is all but identical to that of the single-axle Cabrera. This means that it sticks to the rather compact 5ft 10in by 4ft 7in rear bed. That seems a shame with all of that space to play with, particularly when rivals offer beds of up to 6ft 3in long and more. Still, it feels comfortable with its traditional mattress, domestic-style curtains and padded headboard, plus lights and shelves for each occupant. Cupboard space in the Cabrera is limited, but not so in the Pamplona. The lounge boasts four large overhead lockers and two huge settee bases, the nearside one featuring a moulded liner beside the external hatch. There's a shoe locker by the door, and also a small hatch beneath the offside sofa, giving access to the bed box. Storage in the rear bedroom is improved, too, compared to its single-axle sibling. Like the Cabrera the Pamplona has two overhead lockers and his-and-hers wardrobes, but the large space beneath the bed is now clear, with the table moved to its dedicated locker in the kitchen. The 2017 Bailey Unicorn Pamplona does exactly what you’d expect. It offers the same talents as the single-axle Cabrera (a superb central washroom and a private master bedroom) but with more space, in particular in the lounge. It does seem a missed opportunity that Bailey didn’t use some of that additional room to give this twin-axle a longer fixed bed, particularly when you bear in mind that it’s more likely to tempt seasonal-pitch buyers.